Hamas official says discussion of return of soldiers' bodies only to take place two months after ceasefire. 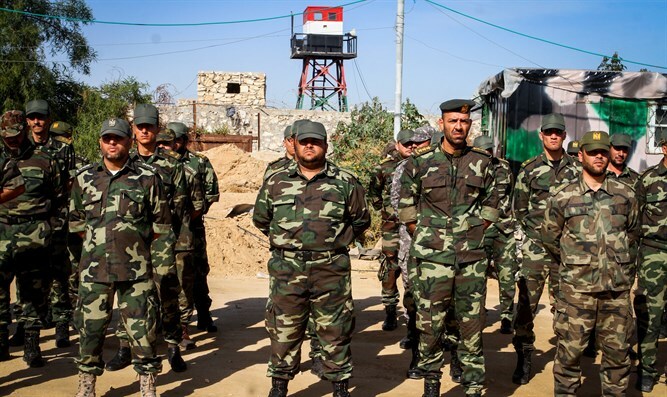 The Palestinian Authority news agency Ma'an published the details of the potential ceasefire agreement between Israel and Hamas and the other terrorist organizations in the Gaza Strip Friday. The report is based on the statements of a senior member of the Palestinian Arab delegation in Cairo. The main points in the Hamas demands included in the agreement include: lifting the blockade, supplying electricity for 20 hours a day, allowing all civilian goods into the Gaza Strip, operating the safe passage from Gaza to Judea and Samaria, and establishing a sea and air port in the Gaza Strip. The official claimed that there was no demand to stop the demonstrations on the Gaza border but it was agreed that Hamas would prevent the participants from approaching the border fence and would stop launching incendiary kites and balloons at Israel. A senior Hamas source said that the issue of the civilians and bodies of Israeli soldiers held by Hamas would not be discussed until Israel's intentions regarding the lifting of the blockade were clarified. He estimated that the issue would be relevant two months after the implementation of the ceasefire. On Wednesday, a political source said that the Israeli Security Cabinet had decided that any future arrangement with Hamas would include the return of the fallen soldiers and civilians held in the Gaza Strip. "There will be no real arrangement with Hamas without the return of our boys and citizens to the home and the promise of quiet for a long time. The current calm is the result of aggressive IDF activity that will continue as necessary. In light of this, the Kerem Shalom operation was renewed and the fishing area was opened," the source said.